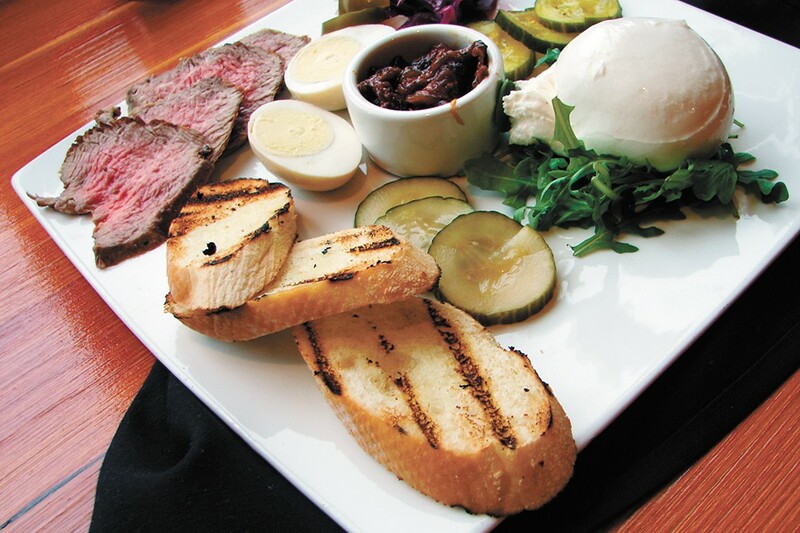 The beef and burrata plate, served with baguette, caramelized onion and tomato jam and pickled veggies. It's hard to know how to take the name of Sandpoint's new eatery, the Fat Pig, in the former Bistro Rouge portion of the Pend d'Oreille Winery. Being a fan of all things pork, the stomach thinks, "Yay, flavor!" yet the memory of evil teenage taunts about weight still stings. Not to fear, though. This is a place that rejoices in food and flavor and welcomes all diners, including the vegetarian-minded. In fact, the availability of not only a vegetarian lunch and dinner menu but also a vegetarian snack menu was the first of many welcome surprises here, and speaks to the owners' lifelong involvement with food. "There is no particular 'theme' to the menu," says Kelley Kennedy, who opened the restaurant with husband Brett Mullinder. "We definitely consider our menu meat-centric, and we like to work with alternative cuts of meat to offer our guest something different than they normally see." Look for lamb meatballs, for example, with Mediterranean baba ganoush (pureed eggplant dip) and fried chickpeas ($10), bacon-wrapped chicken thighs baked in a brown sugar chili rub ($9), and the porchetta sandwich, which is rolled pork belly with cracklings and a fried egg ($12). Also try udon noodle bowl ($19), and delightful duck confit nachos with grilled corn and mild salsa roja ($10). The couple, who hail from Maine and relocated to the area to work at Schweitzer Mountain in 2002, also serve a vegetarian menu with items like bean fries ($8.50), sweet potato tacos ($9), and polenta with wild mushrooms and Brussels sprouts ($15). House-made burrata cheese and pickles demonstrate their commitment to detail. The original print version of this article was headlined "Plentiful Porcine"